If you are wondering where to spend the evening, get broke, or plan a date, here are the 5 brightest stars of Wroclaw. Each place is different – each is unique. They have one thing in common – beer. And this is what I am going to focus on today. According to the legend, there are 360 styles of beer brewed in Belgium – different; one style for a day of the year. The 5 ‘beer-free’ days are saved for the ‘unborn’ beers, which are about to appear soon. But this is only a legend. The truth is that there are more than a thousand styles of Belgian beer.... So you can go trying a new one for more than 2.5 year. 1000 days! Every day a new beer… Certainly, Belgians despise beer monotony. Here in Wroclaw, however, we should not limit ourselves to the fruits of labor of only one nation. Czech, German, and – of course – Polish beers are at least as good as Belgian ones. Ok – but where to go to taste them all? The best beerhouse in Wroclaw – starting point of all contemplation of “where to go today...?” As soon as you enter this place, you know that beer comes first there. How about the decoration and design? Just as I like it – and as every fine beerhouse should look like. It is located in the historical cellar, which ensures the unique atmosphere of the place. And if you can choose 1 out of 12 draught beers (not mentioning over a dozen ones in the bottles), I am sure that everyone finds something for themselves. Oh, and the big news: they organize the premiere of a new beer every Wednesday – this is the best time to let your hair down with it. You’ll probably get surprised to learn how many beer secrets you haven't heard of. And how different it may be... Beer with salt? Been there, tried that. Smoked beer? Been there, tried that. Beer with chili? Yeah, yeah... been there, tried that. If you think there is still something to be discovered in this area, the discovery is just a matter of time. Unfortunately, very often upon leaving the place, you learn that your money has also “been there”. Time to change the surroundings? Maybe some place closer to the Main Square? There you go – straight form the ZUP’s cellar to the bright and spacious Pod Latarniami. This place has much more light, so if you have just bought a new shoes, shirt, or just want to take a good look of that newly-met girl, this is the place for you. It does not matter if you really have something to celebrate – once you are in, you just have to take a sip of beer. And you definitely CAN do that: they have drought beers and the ones in bottles. Lager, ale, sweeter, bitter ones... It’s not an easy choice, but we are not in the danger of getting bored. Neither of saving money. Fortunately, you don’t need to pay for food – aye the beer is considered liquid bread. But if you get really hungry, you will find there something tasty. Wroclaw’s urban legend has it that there was once a brave man who entered this place just “to grab one beer” and completed the mission. Never heard of such. And I don’t believe it. Will you try to face the challenge? If you plan to go there in the evening or to spend a weekend's night – it’s a good idea to make a reservation. We have a lot of amateurs of good beer. If you are in the vicinity of the Main Square, it is always worth to visit Bierhalle – arranged as a German beerhouse, where you can feel the atmosphere of Munich. But – is that really what we aim at? You are in Wroclaw after all! It is definitely a flattery if you say that you can feel the atmosphere of a German town in a beerhouse. And this is exactly what I meant: beer brewed especially for Bierhalle in accordance with German beer purity law Reinheitsgebot undoubtedly makes this place worth seeing. 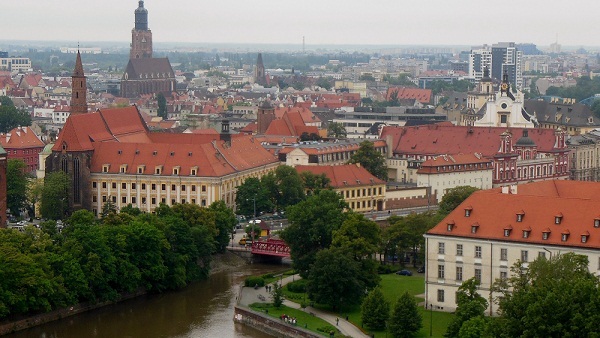 It also decreases the number of reasons Wroclaw’s citizens have to go and see Germany in person. I would specifically recommend traditional beer styles: Marzenbier (famous form the Oktoberfest) and Altbier. You will also enjoy the food, but we are not here to eat, right? Oh! And Bavarian outfits of the waitresses only raise the number of Bierhalle’s fans. Paradise? Well... Czeski Raj is a little bit different form what you might expect after its name. Broke after few visits in Zakład Usług Piwnych or Pod Latarniami? Or maybe you really needn’t have taken such a good look at that girl you mentioned before... Czeski Raj is the place for you. You won’t find a lot of women there, but how about a good Czech beer for PLN 4-5? Hell yes, and as much as you can drink. Literally speaking – a lot of men were actually trying to prove that with their own example. The place where you can feel like in paradise became a second home for many. And they won’t die of hunger, not only because of the beer which – yes, yes – is liquid bread, but also thanks to the range of Czech snacks you can order there: utopence and hermeliny. And, trust me; Czechs know what suits the beer. We have to be ready and prepared for everything – if that girl appeared to look fine, the conversation was nice, and generally there is nothing you can complain about – visit this place. The atmosphere does wonders. I wouldn’t recommend it for the first date – it’s quite dark. And we all know what kind of misunderstandings it may cause. Beer offer is limited in comparison to the aforementioned places, but you will be rewarded with hot chocolate with cherries. And sometimes, you really do look better with a mug of hot chocolate than with a pint glass. Do I recommend it? Do you care more for making an impression than for having a beer? That’s your place! Do you like those places? Discuss about them here! You’ve landed in Wroclaw. What now? Do you now costs of living in your new city? We present a few tips for you. Try them now.